The Episcopal Diocese of Louisiana invites all to come meet our honored guest the Rt. Rev. Bishop Griselda Delgado del Carpio, Bishop of Cuba, when she visits our diocese from August 15-20. Bishop Delgado will be traveling with her husband the Rev. Gerardo Logildes Coroas and her interpreter Marilyn Peterson. Continue reading for a biography on Bishop Delgado and to learn more about Camp Blankingship, a 56 year project that is a dream of the Diocese of Cuba. Born to a respected patents lawyer and a loving homemaker in 1955 in La Paz, Bolivia, Maria Griselda Delgado del Carpio was educated at the Instituto Americano’s Methodist High School. She next attended the Universidad Mayor de San Andres in La Paz, graduating in 1981 with a degree in sociology. In 1982 Ms. Delgado moved to Cuba to enter the Evangelical Seminary of Theology in Matanzas, Cuba. Griselda remained in Cuba and was ordained as a deacon in 1986. Shortly thereafter, she arrived at Itabo, Cuba, a small town with little acquaintance of Jesus Christ, to serve at a church property, with crumbling walls and no roof, known as Santa Maria Virgen. Working from a small house across the street, Deacon Griselda began introducing the townspeople to the love and hope of Christ. In 1991 Bishop Emilio Hernandez ordained Deacon Griselda as an Episcopal priest in a ceremony of ordinations that included three other women, the first four women priests of the Episcopal Church of Cuba. She continued at Santa Maria Virgen as Rectora for the next 20 years, inspiring the congregation of Santa Maria Virgen to work together to build their town temple back proud and strong, to build a self-sustaining community system of agro-ecological farms on and around the church, and to build their relationships with each other and with God. In September 2009, the Cuban church, for the second time, failed to elect a bishop coadjutor. After 13 inconclusive ballots were cast, the choice of a coadjutor fell to the Metropolitan Council of Cuba (Bishops from USA, Canada and West Indies), which Council has governed the Cuban church in matters of faith and order since its 1967 post-Revolution separation and autonomy from the U.S.-based Episcopal Church. On February 7, 2010, The Rt. Rev. Griselda Delgado Del Carpio was consecrated as bishop coadjutor for the Diocese of Cuba and was installed later that year on November 28 as diocesan bishop of the Episcopal Church of Cuba at Holy Trinity Cathedral in Havana. She became the first woman to serve in that role as diocesan bishop of Cuba. At the time of her ordination as bishop, the Cuban church included about 40 congregations and some 7,000 Episcopalians. “La Obispa,” as she is affectionately known, is the proud mother of three now-grown children: Griselda Edith, Lautaro, and Marcela Beatriz. She is married to Cuban-born Gerardo Logildes Coroas, a building contractor, who was recently ordained as an Episcopal priest and now serves not only as priest at the Bishop’s former parish in Itabo but also as Project Supervisor of Camp Blankingship near Santa Clara, Cuba. Camp Blankingship- A Dream Coming True!! First, let’s give thanks again to the United Thank Offering for awarding to the Diocese of Florida Cuba Committee a 2014 UTO Grant of $51,750.00 for materials to begin the first year of construction of Camp Blankingship, uniquely located in the geographic center of Cuba near the colonial city of Santa Clara. Next, to appreciate the UTO purpose for this Grant, let’s go back 55 years ago when the political landscape of Cuba was dramatically changed by the Cuban Revolution. The Rt. Rev. Alexander Hugo Blankingship was a man of God with great energy, limitless vision, and many dreams for the present and future generations of Episcopalians in Cuba. He stabilized the Episcopal Church during his episcopate (1939 -1961) by building the diocesan Cathedral campus as we know it today, that nucleus including the Cathedral Santísima Trinidad, a school, homes for the Bishop and Dean, the diocesan center, offices, classrooms, dining room, kitchen, auditorium, dormitory, and other structures located in the Vedado area of downtown Havana. On June 25, 1959, this much beloved Bishop also had the foresight to buy 10 acres of rural farmlands (with a river running through it) for the purpose of developing his next dream for Cuban Episcopalians: a camp and conferencing center for the Episcopal Church in central Cuba, strategically accessible from both ends of the 777-mile-long nation island. The Bishop’s dream envisioned a place with dormitory cabins, activity and community centers, self-sustaining farmed lands, and a chapel, where children and youth can camp out and swim in the river on the property; where men and women of the laity and the clergy from all over Cuba can more readily convene for meetings, workshops, conferences, annual Synods, spiritual retreats; and where Cuban Episcopalians can welcome and host their foreign sisters and brothers … to eat, sleep, work, learn, play, and pray together in the Christian serenity of God’s exquisite natural surroundings. But in 1961 with Fidel Castro’s decision to choose a communistic system of government for Cuba, Bishop Blankingship, his wife Antoinette, and his three children Hugo Jr., “Toni” and Wyatt, returned home to Richmond, VA, and the Episcopal Church of Cuba had to separate from Province IV of TEC, thereby becoming an “extra-provincial” church of the Episcopal/Anglican community. During those early years of the atheistic Revolution regime, the church in general suffered uncertainty, suppression, neglect, and priests were politically imprisoned during the 1960’s. The camp grounds were abandoned and Bishop Blankingship’s last dream took a dive into a long, deep slumber. The last American Bishop of Cuba, A. Hugo Blankingship, Sr., passed away in 1975 and is interred at the historic St. John’s Episcopal Church in Richmond (where American forefather Patrick Henry delivered his famous speech, “Give me liberty or give me death”). Despite the US embargo, blockade, and Cuba’s loss of an American presence in the 1960’s and 1970’s, the Episcopal Church of Cuba with its remaining 10 priests, 40 churches or missions, and 2000 communicants quietly and courageously survived the earlier decades of the Revolution. One of those priests, the Rev. Emilio Hernandez, during his 8 years of imprisonment and from Prayer Book memory, regularly celebrated the Eucharist, keeping Christ alive in the Cuban prisons. After his release, he became Bishop of Cuba in 1982. At the House of Bishops conclave in 1984 in New Orleans, Bishop Emilio Hernandez found his former American priest friend who had served San Juan Bautista in Florencia and who had joined him on horseback performing pastoral visits in the early fifties. That young priest friend turned out to be our own Bishop Frank Cerveny. At that happy reunion in 1984, these two friends (now both bishops) conceived the idea of a Companionship ministry for the Dioceses of Florida and Cuba. Excepted from the US embargo travel restrictions with their lawfully issued “religious visas,” the first small delegation of Episcopal Floridians traveled to Cuba in 1986. Now in its 28th year, the Florida-Cuba Companionship ministry and its assisting Diocesan Cuba Committee have blossomed into hundreds of Floridian companions visiting, befriending, and building Christian relationships with over 7,000 Cuban Episcopalians in 45 churches and missions throughout the island nation. Through the years the memory of Bishop Blankingship’s last dream has been passed down from one generation to the next. Its message of hope for Christian community in Cuba and solidarity with American Episcopalians continues to beckon us all with fervent calls to become a reality. Although Bishop Jorge Perera Hurtado inspired Cuban volunteers in the early 2000’s to excavate portions of the camp grounds for future construction sites and to drill two water wells for later camp consumption, the embargo, the economic depression, the scarcity of building materials, the abject poverty in Cuba and the political stand-off between our two countries thwarted Bishop Cerveny’s earlier attempts to boost the Camp Blankingship dream with available funding at that time. However, in 2010 the Rt. 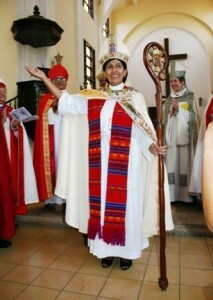 Reverend Maria Griselda Delgado Del Carpio was installed as the new Diocesan Bishop of Cuba. She successfully urged the Cuba Committee in Florida to awaken the dream once again and to bring the Camp Blankingship Project to fruition. 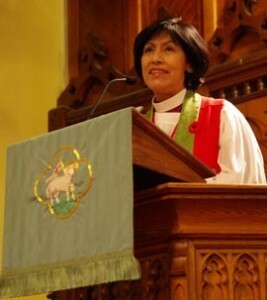 In the past three or four years, the US embargo travel restrictions have been easing, Cuban law has recently begun allowing individual ownership and alienability of property, and Bishop Griselda has shown from the Cuban public records that the camp acreage, after 55 years since the Revolution, is still titled in the name of the Episcopal Church of Cuba. The time is now ripe to break ground and give birth to Camp Blankingship. In 2013 Bishop Griselda presented detailed Camp plans, architectural designs, photos, a written proposal and budget for a five-year building plan to Bishop Samuel Johnson Howard of the Diocese of Florida. Cuba would need funding from America while Cuban volunteers would provide the majority of the construction labor. Mission volunteers from Florida and other interested dioceses in America are already making travel plans to lend helping hands for Camp Blankingship. The Cuba Committee, chaired by Julia Sullivan of Holy Comforter, Tallahassee, started a general funding campaign for the Camp in late 2013. The two Bishops of Florida and Cuba approved and processed a companion diocesan application for a 2014 UTO Grant to fund the purchase of building materials for the first year/first phase of the Camp Blankingship Project. The construction supervisor in Cuba is Gerardo Logildes Coroas of Havana. Marilyn Peterson of Holy Trinity, Gainesville, is designated as the Project Director in the US. Shortly after Pentecost Sunday 2014, we learned of UTO’s grant award to the Diocese of Florida for Camp Blankingship. Thanks be to God for years of prayers being answered … and the Holy Spirit moves a grateful many onward to new unifying works and service in His name!